Time really flies so fast. In less than a month, it will be my favorite time of the year. It will be my birthday and Christmas again. Few weeks after, it will be New Year's eve and we have to bid goodbye to another year again. While waiting for the most awaited celebration and vacay, what I'm up to right now? As always, office work, teaching and combating all problems and challenges that life is giving me. I may sound pessimistic but that's how things are going now. Grown up problems that act like a bitter pill that I should gradually chew. As much as I wanted to complain, I guess I should rather divert my energy in searching for solutions and what my students are always saying, focus and catch the GV (good vibes)! Hi Jill-Yan! Tama ka hahaha Mukhang we have a lot of things in common ha :) Same birth month and probably, same interest for movies. My bday is actually days before Xmas. I have no clue about the movie - do let us know! Cute features. Thank you for hosting another fun party. Enjoy your weekend. I love this time of year too. it all starts with our birthdays and then holidays follow. 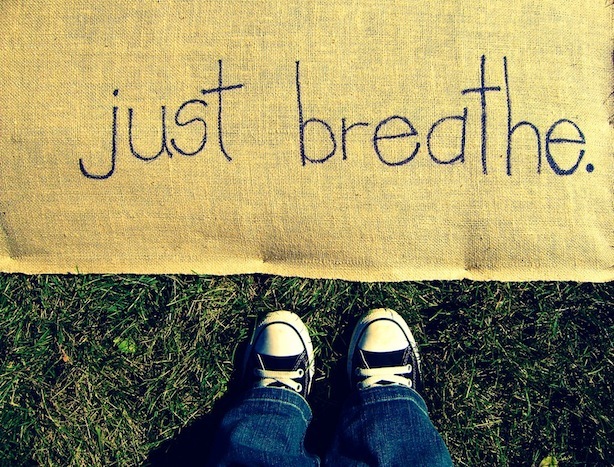 It's a good message to remember to just breathe! Good Sunday morning...here! I hope you've had a wonderful day and gotten some rest! Sweet hugs to my namemate and friend!